If you're looking to improve your game, specific tennis training is guaranteed to make you a better player. Whether the training is on a tennis court or off it, there are literally hundreds of ways your tennis can benefit from applying tried and true tennis training methods to your game. Whether you're looking for tennis drills for kids, tennis drills for beginners, or tennis drills for advanced players, I have put together an extensive range of tennis training drills just for you. Some of the drills are just general fun tennis drills, others are hard-core tennis practice drills for advanced players. If you're interested in improving your speed around the court (who isn't? 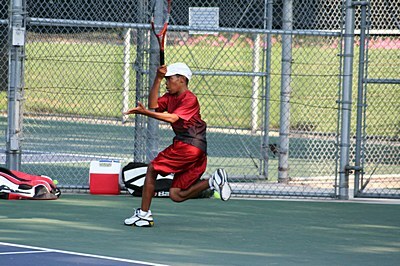 ), I've even included specific footwork drills for tennis. And if there aren't enough free tennis drills on my site, you might want to take a look at this tennis drills video that is hugely popular with professional tennis instructors around the world. While many tennis coaches have a collection of instructional tennis videos, if you want to become a student of the game yourself, building a library of quality tennis instructional videos will definitely add to your tennis knowledge, and increase your tennis I.Q. It's also a great way to keep track of how tennis has evolved over the years. For instance, there was a time when coaches were teaching players to use a continental grip on the forehand (trouble is, I don't think there were any instructional tennis videos on the market back then). I wonder if in forty years time, semi-western forehand grips will be a thing of the past?! Tennis coaching is more specific than tennis training. Generally speaking, coaching is more about teaching proper tennis technique; namely, the specifics of teaching fundamentally sound tennis strokes, proper tennis footwork and a thorough understanding of basic tennis strategy. The two terms -- tennis instruction and tennis coaching -- can be used interchangeably. They mean the same thing. For instance, if you're looking for tennis serve instruction to help you develop your kick serve, it's exactly the same as looking for coaching for your serve. Instructions on how to play tennis are what a coach will tell you in order to improve your game. If you're really serious about your game, all you need to do is look at what the pros do to get an edge over the opposition. For instance, many pros now employ sports psychologists who assist with mental tennis training. The same can be said of physical tennis training, with extensive use of tennis specific sports weight training and training methods like plyometrics, designed to increase explosive speed around the court, and the Agility Ladder, which develops co-ordination, balance, quickness and agility. Like anything else, if you want to find your ceiling of tennis potential -- or even just improve your game enough to deal with those pesky pushers who drive you mad with their moon balls -- the right tennis training will go a long way to getting you where you'd like to be.